Bourbon Butter Venison Steak Tips are full of bourbon and butter flavor! Use regular syrup or go sugar free for a low carb version!. The Venison is melt in your mouth delicious! When I read that Sunday Supper was going to be sharing recipes with ingredients that are hunted or foraged this week I knew I would be participating. 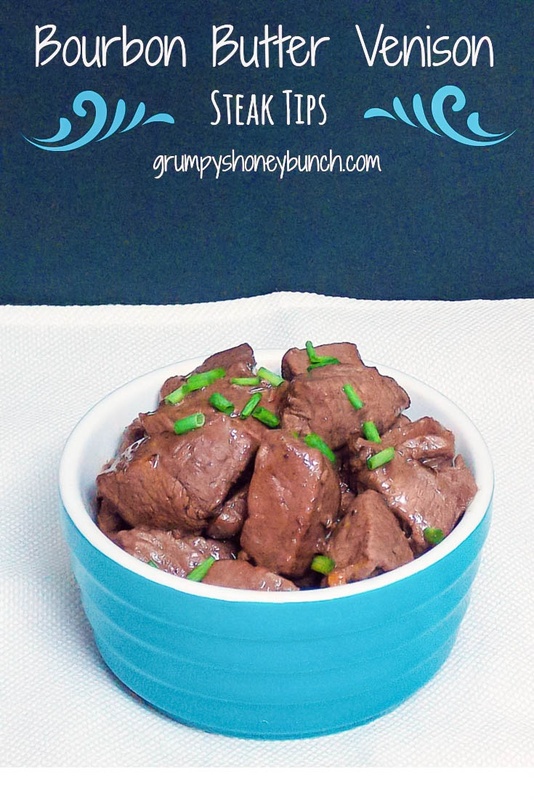 Grumpy is a huge hunter and we always have venison in our freezer! These Bourbon Butter Venison Steak Tips are going to be mind blowing to the game meat lovers in your home! I wanted to do something I had never done and I wanted something that would have amazing flavor. While I love all types of booze in my cooking and baking, I really had never used bourbon before so I decided to try it out on a recipe I found in Cooks Country and adapted it slightly to fit what I had for ingredients and swapped the venison for the beef. I served this as a meal with a Chipotle Mashed Potato recipe and Roasted Asparagus. These also could be an appetizer! Loved it and will definitely make this again! *TIP FROM GRUMPY* – when prepping your venison, it pays to take the time to trim the meat and removing any silverskin. This helps remove some of the “gaminess” of the meat. I ususally make Grumpy do this because it is a tedious job! 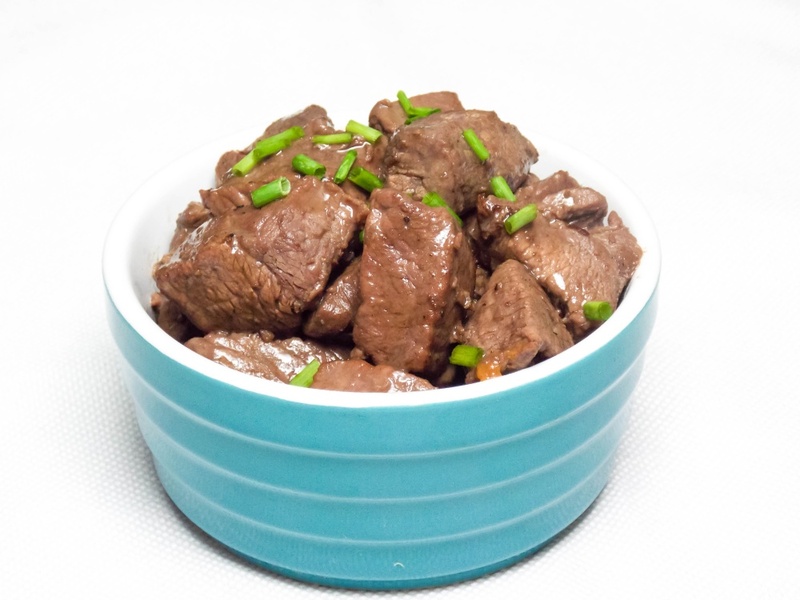 Bourbon Butter Venison Steak Tips are a full of bourbon and butter flavor! Use regular syrup or go sugar free syrup for a low carb version! Pat steak pieces dry and season with salt and pepper. Heat 1 tablespoon oil in large skillet over medium high heat until just smoking. Add steak and cook until well browned all over, about 6-8 minutes. Transfer to platter and tent loosely with foil. Remove skillet from heat and add bourbon, maple syrup and cider vinegar. Return to heat and cook until slightly thickened, approximately 3 minutes. Be sure to scrape any browned bits up while sauce is cooking. Remove from heat and whisk in butter and chili pepper flakes. Season with salt and pepper to taste. Return venison and any accumulated juices to skillet and toss to coat. Sprinkle with chopped chives. Use a sugar free maple syrup such as Lankato for zero carbs and to make this recipe Ketogenic. Always have venison in your freezer? I'm coming by! I LOVE venison and can't get it in my area and I don't know any hunters. My BIL is the hunter in the family and he always has a stash of venison in his freezer. I'm going to share your recipe with him…it sounds terrific! I would be hoarding the bowl all to myself, Shelby! What a great sauce for those tasty bites of venison! I LOVE venison. Wish I had some in my freezer. My local hunter friends keep us supplied with wild boar. I only get venison when I visit my in-laws. This recipe looks SO good. Shelby: I have got to make this recipe. All the ingredients I love, including the venison. I love the sweet heat in this recipe, that venison is making me drool!! WOW, I wish when I had venison growing up it was like this! Only had it a few times but it was enough then ha! Love the addition of bourbon to this dish! I grew up on venison but haven't had it in years! Great idea! All my favorite flavors on delicious venison, sign me up!! This looks delicious! Wow, I wish I had a freezer full of venison! I haven't had venison in ages, but will have to change that soon! I've got some venison coming my way and I'm definitely trying this. Sounds yummy! One question, though. I don't drink, so I wouldn't want to buy a bottle of bourbon for just half a cup and then have the rest go to waste. Do you have any suggestions for a substitute? U can buy mini bottles or pints but bourbon will last for a long time without going bad! I would suggest apple juice as a substitute. Thanks for asking! been eating this kind of venison for years up in Northern Minnesota, will continue to do so, very lean and clean. So glad to hear you loved it! Is there any special way that you tenderize your venison before cooking it?. Would the round steak work or does it have to be the tenderloin? Lela, I went to Grumpy, who is the venison cook master in our home, he says tenderloin is best, no reason to tenderize it before you use it. Grumpy says cook venison the way you like your steak, however, if you like it well done, it will be tougher. Medium to medium rare is best for tenderness. This was fantastic! I loved the yummy sauce that cooked down. It coated perfectly. Thanks for a great way to fix our yearly venison! I’m so glad you enjoyed it! Thank you for letting me know! YUM! This venison looks so tender and moist – simply delicious! Can’t wait to try this recipe soon! My husband loves venison but I have never cooked it. I’m going to have to try this. My husband’s friend is always sending venison our way. I can’t wait to try this! I have never had venison….but we love to cook with bourbon. Sounds like a meat lovers dream. I will have to see if my neighbour has any left in his freezer. Maybe I can convince him to give it to me…if I give him this back in return. 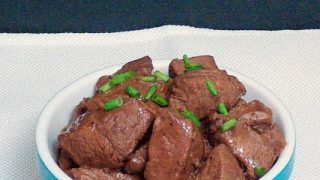 One of my recipes to cook vension steak. I cover mine in olive oil over night to soften it. I also add mushrooms to the meat and serve it over rice with plenty of sauce. Hi Jamie! We love mushrooms, a great idea also to cover in oil to soften it (and add fat – if your keto like me!) Thanks for stopping by and commenting.